Let's examine another point that's very important: the anomalies in the S1000RR engine management system that Mr. Acton described were not malfunctions. The loss of throttle control, the inability to accelerate when the bike was leaned, and the (unexpected) surge of power when it was partially righted are apparently how the electronic engine and traction control management system for this bike is designed to work under those conditions. Oddly, in the review of the S1000RR, Mr. Acton did not seem alarmed by a situation where control of the bike was apparently out of his hands, and he generally gave the bike a favorable review. So here we have an example of an anomaly in the electronic engine control system when the bike is functioning properly. How about what happens when things do malfunction? "I had some ... electronic issues, one being that the engine would suddenly go into 'limp home' mode after about 4 hours on the freeway. I found that shutting off the main switch for a period of time would ... allow the system to reboot ... and then it would start and run normally. The error message on the dash showed 'check DPS computer.' DPS is Dynamic Power Steering ... sort of a "mother" computer ... and if a fault in any of the other systems occurred, the DPS computer would signal the Engine Management Computer to initiate a loss of power ... I [later] discovered that the leaf spring on the brake pedal was not giving the appropriate 'brake off' signal to the DPS computer. I did a little adjusting with needle nose pliers, and solved the 'limp home' problem." As many know, "limp home" mode is when an engine management system will limit speed and acceleration in order to prevent engine damage when a problem occurs. However, in this case, the limp home mode activated on a freeway, when the problem apparently had nothing to do with an engine malfunction. Here is a case where an electronic override system caused a motorcycle-based vehicle to suddenly slow down on a freeway while other traffic around the vehicle would normally be maintaining highway speeds. While this might make sense if the 'limp home' mode had been activated due to an engine problem, should it have been caused by a simple mechanical problem with a brake signal switch? Most would probably argue no. "I'm not so concerned about complex systems when they are brand new. I'm more concerned about maintainability. What happens to the high-zoot electronic system 5 years down the road, or longer? ... The owner who has all of his maintenance and repair[s] done at the dealer's shop will buy a brand that has a nearby dealer, and be clever enough to trade it in as the warrantee expires. But for owners such as myself, who ... do our own servicing and repair, there is a practical limit to how complex a machine can be." As David points out, what happens to drivability of the motorcycle when a totally integrated throttle/traction control/braking system starts to have problems, or components wear out? The increasingly higher levels of technology may start to yield diminishing returns when the engineering that goes into them gets so complex that a machine can no longer be reasonably maintained by an owner, and very high expense is necessary for their repair. Have you had your motorcycle in the shop for repairs lately? Even the simplest maintenance procedures performed in a motorcycle repair shop often yield an expensive bill. Try to imagine the bill when electronic engine management components begin to fail and problems have to be diagnosed and repaired at a dealership. And trading a bike before the warranty period expires is an option that most in this day and age cannot afford to make. Perhaps a "simpler" throttle by wire system that is not part of an overall engine management system may not be significantly more complicated in principal than throttle cables, but there are some notable differences: finding the source of a cable problem will usually only require visual inspection, maybe getting the bike back to your garage and removing the fuel tank or body panels to locate a cable restriction, or to lubricate a cable or replace a broken one. Repairing an electronically controlled throttle system would typically require troubleshooting knowledge that exceeds that of a typical DIY mechanic, and the use of diagnostic equipment that most will not own or even know how to use. So how much more will the repair costs be for the higher level complexity of systems that incorporate motorcycle throttle by wire, traction control, and braking into an engine management system? How much of an effect on the ability to continue operating the bike, along with the safety of the rider, if a failure of even one of the systems occur? As these systems are still relatively new, the jury will be out for some time. Of course, it is understood that a tremendous amount of R&D goes into making these systems useable, functional, reliable and safe. And, in the vast majority of riding circumstances, riders will find the increased options for choice of ride type; handling and braking capability will take motorcycle riding to a new level of comfort and convenience. While in the majority of situations the computer will choose the best combination of handling characteristics in a given riding situation, some of the reviews and reports indicate that this may not always be the case. David Hough's experience with his Spyder going into "limp home" mode due to a simple mechanical problem is one example, John Acton's description of the BMW's behavior is another. There are also discussions posted on several Harley Davidson owner group sites concerning idle variation problems on some 2008 models using throttle by wire, most notably V-TwinForum.com and HDForums.com, with the latter having a link to a service bulletin released by Harley Davidson referring to a TBW problem. Several posts say that the throttle control problems occurred while the bikes were being ridden, rather than just at idle. Further, in the cases of claimed unintended acceleration in automobiles, a throttle and engine management computer may have no direct "cause and effect" as to how they may operate should a control system get an errant control input. That it uses an electronic signal rather than cables, a system malfunction could conceivably result in a variety of unexpected control problems, simply because a triggering electrical short, open circuit or component failure could cause an electronic hardware problem, a software error, or both. A bike may accelerate, go to idle, shut off, go into "limp home" mode―any of a number of unexpected behaviors―based on a wrong signal in an electronic engine management system. In the engineering career field, there is a concept known as "elegance". It is the idea that the more you strive to keep electronic systems and their software programming simple, the less likely that bugs or unintended outcomes will result. 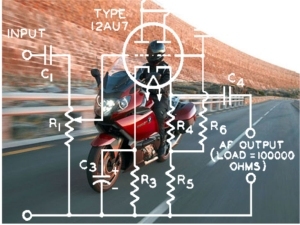 The idea of keeping motorcycle control systems simple is worth considering for this reason. Consider also that following the "kiss" principle here may also be a good idea due to the lower level of physical protection for the rider of a motorcycle, as opposed to a car. There is a logical connection between these two thoughts: if a throttle system were to malfunction causing unintended acceleration, a resulting accident would certainly have a greater potential for serious physical injury on a motorcycle than in a car. For this reason, it may be best to opt for bikes with the tried and true cable control system or a simpler throttle position sensor until these more complicated systems get some history behind them. Technology with a proven track record of decades in use are logical additions to motorcycles, and while electronic fuel injection and ABS brakes are more complex systems (respectively) than carburetors and simpler hydraulic brakes, you get a lot in the trade-off for the relatively small increase in complexity. In an ABS brake system, a brake pad change is still a brake pad change, and these are generally passive systems, where their effect on motorcycle operation is secondary to the rider's input. Not so the case in more complex engine management systems, and some consideration should be given to fully "working the bugs out" before applying these systems to a motorcycle.